This page will be a list of the most frequently asked questions regarding the Grasshopper portable vaporizer created by Hopper Labs, LLC. I will keep this page updated regarding changes and try to keep the most popular questions towards the top. 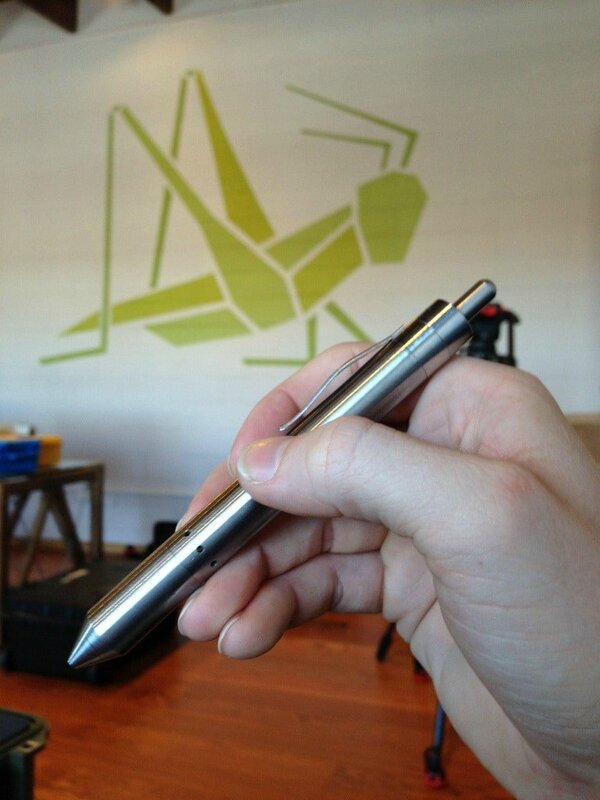 If you have a question about the Grasshopper feel free to leave a comment below and I will add it to the FAQ. This Grasshopper FAQ is a bit out of date. The Grasshopper is now shipping on-demand and you can check out my Grasshopper vaporizer review for the latest info on shipping, pricing, and to see how it’s holding up. Check out my best portable list for more portable vaporizer options. 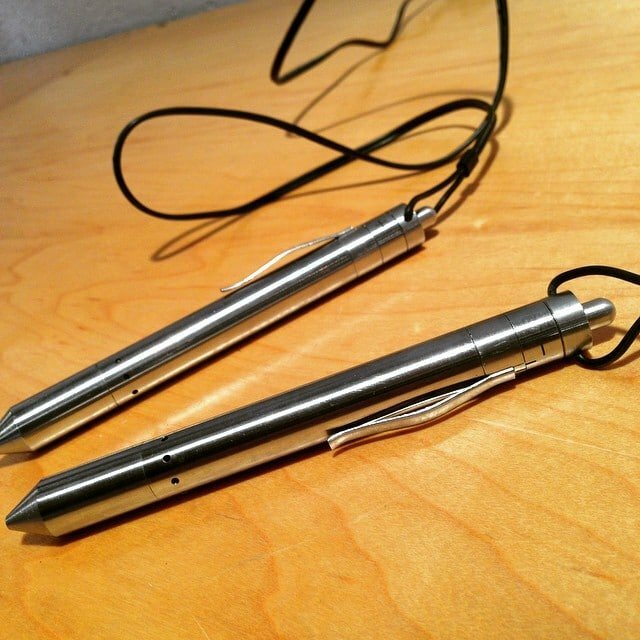 The Grasshopper is a portable convection vaporizer that mimics the look of a pen. It’s one of the smallest and most powerful vaporizers I have tested. The GH (Grasshopper) is turned on the same way you would use a pen. Simply click the button, the chamber is heated in 2-5 seconds and you’re ready for your draw. Now the GH is a bit different from most portable vaporizers in the fact that it’s not a session vaporizer. It’s more on an on-demand portable that provides instant heat. There’s no need to leave the bowl on in between hits. Simply click the button, wait for the blue light, hit it, then hit the button again to turn it off. I use this method because the mouthpiece does tend to get a bit warmer when taking multiple draws on higher temps. The unit does come standard with a silicone mouthpiece guard to help deal with the temps if you decide to try and use it as a session vape. So let’s go ahead and jump into the most frequently asked questions for the Grasshopper vaporizer. Q. How many temp selections and what is the temperature range? A. Temp control is pretty precise and its a much bigger spectrum than just 5 temps. Because its on a rotary dial, you don’t only get 1-5 but 1.2, 1.5, 2, 2.6, 3.3, etc… so you can fine tune the temp that works best for your herbs. The temp ranges from 130 °C – 210 °C (266 °F – 410 °F) and each tick represents 20 °C in change. Q. Is there battery level indication with the LEDs? Like before it dies fully letting you know, or even telling you levels? A. There is no indicator until the battery gets low. It warns you about 1 draw before it shuts off, and then it won’t heat once it drops further. Trevor was open to the idea of adding an indicator if someone could think of a way of doing it without making use confusing. (There is only 1 led, and it can only do 2 colors, and they cannot both be on at the same time, so most of the ideas we discussed made regular use confusing) But he said he can modify software up until he gets back from China, so if anyone has any clever ideas for the next 2-3 weeks, its definitely possible to add. Q. Is it better to click on and off or let it autoshut off at 18sec? A. I definitely prefer to shut it off, because it conserves battery, keeps the unit cooler, and I assume it saves herb as well. Its crazy how powerful this thing is for its size, it can kick out 45watts, whereas the Crafty is only 27w and the Mighty 30w. Q. How much herb can fit in the Grasshoper chamber? A. As far as load size goes, I filled it with the herb I have right now, which is a bit more moist than I would prefer, and it fit .30 grams into the chamber. Q. Have you tried sessioning with another user or two? How did that go? A. Yes there was 4 people passing one around and we went through two bowls without stopping other than to repack. We did use the mouthpiece though. I also used it a lot of times with 1 other person and we would pass it back and forth until the bowl was finished without the silicone. Q. Can you do more comparisons with the Firefly? A. I will definitely do more comparisons to the Firefly, unfortunately I haven’t hit it in about a week due to the trip, and I am also testing the Pax2 and the Series7 at the moment so I probably won’t touch on side by side comparisons for a little bit longer. Q. Is it better to finish a whole bowl at one temp than to temp step? A. So far I have been enjoying both. A few bowls I started low and worked my way up, I have also done a few bowls at various temps in the 3.75-4.25 range from start to finish and enjoyed them. I have also even enjoyed the monster rips I can get on 5 when I am out. For example when I was snowboarding, I would pull it out, and just take 1 good rip, and then put it away. I got 4 or 5 hits that day and it kept me exactly where I wanted to be, without having to waste for than 30 seconds each time I stopped to vape. Q. What is the Mouthpiece guard material? A. The Mouthpieces are made of Silicone. They 3d printed a mold, and poured silicone, however they did say that the ones that come with production units will be nicer/better in some way. Q. How long does it take to charge the Grasshopper and how do you charge it? Q. Will there be any differences between the BETA unit and the PRODUCTION unit? A. There was a bit of talk about what exactly they are modifying in the final units compared to the ones I used. First they have a better screen, it is designed, but it wasn’t in stock while I was there. Second they are changing the threading slightly on the mouthpiece so it goes on and off with a bit less turning. Third they are changing the charger, they are both making the chord thicker, and they are increasing charging speed by roughly 50%. Q. How warm does the mouthpiece get and does it come with a guard? A. There were some questions about the unit getting hot. Yes it does get hot if you keep hitting it. It does have a few things going for it that makes it not a big deal for me. First is that it loses heat VERY fast, so if you take a draw, turn it off, and just hold the unit for a few seconds before your next draw, it doesn’t get hot. If you want to turn it on high and kill a bowl in a few hits you can put the unit in your pocket for 1-2 minutes and it will be fully cooled down for bowl #2, or if you want to kill bowls fast at high temp and chain them one after another, the silicone mouthpiece makes this possible. Q. How do you clean the Grasshopper and how hard is it? Q. How exactly does it indicate the “battery’s low?” Like does it flash a certain color? Also, I’m guessing the 2 colors are red and blue? A. While the unit is heating up its Red, then when its ready it goes Blue. If the blue light starts blinking fast while you are drawing you are near the end. I actually just had it happen on a bowl a moment ago and I got 3 draws before it died. (including the draw it started blinking on) When it dies it starts blinking the red light fast during your draw. You write that it’s a conduction and convection vape while the grasshopper FAQ claims it’s pure convection. I’m confused. Which is it? It starts off pure convection, but after a few draws in a row the unit/bowl starts to get warm, and it starts to also have some conduction heating going on. I’m bummed to hear that. Hopefully it’s not too problematic. I guess one could just hit it once, turn it off, then repeat as necessary to minimize the accumulation of heat but that makes it less appealing as something to pass around and share. It is still mostly convection even once the unit is warmed up, also since the grasshopper is very powerful, you can finish a bowl in just a couple minutes, so when it’s warming up at the end, it’s a very short while. I am so excited! I’ve been waiting since the 3rd day of the campaign for the Grasshopper to come out. I think this is going to be a great piece to enhance my collection. Also, it’s about time I need a real vaporizer. Would turning the unit on and off so many times (if you were to take multiple hits but didn’t want to leave the unit running to prevent it from getting too hot) wear down the battery or any components of the vape? Do you have any pictures with the silicone mouthpiece? Turning the unit off inbetween draws is a good practice to help conserve battery and prevent extra unecessary heat. You can even click the unit off, and continue drawing for a few extra seconds to remove the extra vapor/heat. With some other various vaporizers I have / use I can run into the issue of the herbs burning and putting off smoke if the heat gets too high or the herbs get too compacted. Have you had this issue at all with the Grasshopper, especially on higher temps? Thank you for a well-written review. I’m a FF owner and love it aside from the battery life – for that reason alone I’m considering switching vapes. How would you compare the battery life of the GH v. the FF? Many thanks! hey, how is the the draw resistance? besides the fact that I’ve been looking for a perfect one hitter vape the reason I’m buying the grasshopper is mainly because of the draw resistance at the end of each session makes getting the rest out of your herb an effort with the firefly plus the fact you have to pack the bowl full enough the herb doesn’t move more than a little if at all. ( weirdly i heard reports of people having different experiences otherwise no vapor also and you nobody seems to mention that the firefly is a hybrid probably by accident but with the compact design of the convection heater as Soon as the bowl is preheated the bottom is hot enough to singe the herbs causing every bowl to have at least a bit of black on the herb that touched the bottom longer meaning it is a hybrid however i believe since it was designed as convection heater the conduction is simple a design error so the hot air still heats at least the majority of the herb mainly the bottom (forcing you to still the bowl or risk wasting as many as 3 potent hits contributing to the fact of it still having the best flavor and strongest vapor. these are simply some things i noticed and have been curious about. My main question is how does the resisitence of the grasshopper compare to the firefly? Very little draw resistance and that’s one of the reasons that I really like the Grasshopper. The heater in the Grasshopper is also much better than the Firefly and I can literraly draw as hard and it will keep producing large couds. With other vapes, the harder you pull, the faster the temp drops and the less of a hit you get. Not with the Grasshopper. I would agree. I just purchased the GH as my on-the-go vape, while keeping the FF for home use. So, how does a user activate “battery-indicator mode”? …At the very least, it should be in BI-mode when charging the unit! Again, this is a very simple, basic feature that all high-tech devices should have that was obviously overlooked… I truly wish you can relay this to the Grasshopper team for the benefit of everyone! I like your idea. Maybe it could do the blinking when you first turn it on (I like how Arizer Solo shows the battery level through the temp levels briefly when you first turn it on). Like, click the top, the light blinks 3 times for 75% as your example (at the moment it is a solid light when you turn the unit on for heating up, so instead it could do 4 blinks for 100%). How is the battery life? It’s awesome that it can be used while charging. And also, how does the AVB come out? Have you used any for edibles yet? Someone other than me please point these things out, lol Buzz? I really appreciate hearing your experience and opinions, and it should help other readers get another viewpoint on the devices. While I do use my Hopper more than my FF2, I love the vapor quality from my FF2. I can finish a bowl in just a 4-5 draws like I can with the GH, but the vapor is less hot/harsh and more flavorful. Whenever I get a new strain that smells good, I immediately reach for the FF2 for the pure smooth flavor. Ironically when I went on a road trip to Washington recently, the only two portables I took were my FF2 and my GH. I used the FF2 in the hotels at night, but used the GH all day while out and about. In my opinion unless you are very sensitive to warm vapor, the Grasshopper simply cannot be beat for a vape to carry on the go. I also completely agree with you about the GH being VERY efficient, I have tried putting the AVB into other units like the vapexhale cloud evo, and the volcano and the GH does a fantastic job of extracting everything without stirring. Thanks for the detailed FAQ! Very informative. I do just have one question. How does the Grasshopper compare to the MFLB? I’ve had my MFLB for almost 6 months now and I take it everywhere I go and also use it at home with the PA 2.0. However, I’ve also been following the GH campaign since it came out on Indiegogo. Basically I just want to know how it compares to the MFLB overall. Would you suggest me buying the Grasshopper or just sticking solely to the MFLB? Anyone? I’m still not sure whether to buy the grasshopper or not as I own an MFLB. Just wondering if you had any issue with the mouthpiece getting too hot. Also, I own a Crafty and it’s great, but I often find my throat a bit raw afterwards, did you experience this at all? I think the air is too hot. maybe because of the short stem on the Crafty. I had a Solo and never had this problem before. The Crafty has a bit cooler overall vapor than the GH, but the GH is like the Crafty, where it has a lot of power, so if you crank it up high on a fresh bowl, it can make some really dense vapor and be harder on your throat. Thanks for the other answers. Also was wondering on the resistance during pulls, is it difficult like the Solo or free flowing like the Crafty? The GH is definitely more free flowing like the Crafty. I found the Pax 2 and Air to have quite a bit of resistance compared to these two. There was an earlier suggestion of a stealth mode (no lights) do you know if this was implemented? I have not heard anything about this mode unfortunately. Hey Buzz! Love the review. I was wondering what grinder you recommend for the Grass Hopper. I currently have the Space Case. Space Case will be perfect. I use my Santa Cruz Shredder! The day you were snowboarding and took 4-5 hits throughout the day, how did the flavor hold up? Was it almost as fresh at the end of the day? Not as fresh but I could still pull decent clouds and the heat up time is definitely legit for the lift. Hey Buzz, I have a question for you. I just got my Grasshopper 3 days ago today. And on my most recent bowl when I was killing the remainder on temp 5 at the very ends of my hits it would blink red and blue the color combo that usually means there is a problem. Then when I shut it off it works normally again so far it seems only to happen at the end of the sessions when it gets really hot and this is the first time i’ve seen this. Have you had this happen or heard anything about it or what it could mean? Hey Brandon, is it doing it with all batteries or just one? The strangest problem is that I get a completely actaully an increadibly extracted ABV through vaping with water or an attachment period. but when I go to hit it directly I can only get a light brown vape at the same temp even with extra burns to be through. I’m doing more testing but I don’t see how much my results can change. IN you’re video even with direct sessions on temp 4 and 5 where darker what mine looks like is the abv on temp3 maybe close to 4 so 3.5ish ill double check after my test I need to get a picture to compare. The difference is lol for lack of better words unatural or unexplainible unless somehow putting it through water extracs more active ingreadieants tho that’s wishful thinking i’m sure. let me know what you think as you’ve had much more experiance with you’re preproduction unit and The current or whatever you got. It seems to be they’re constantly making upgrades. ie. the screen from somewhere around unit 500 and 600 between them got changed where there are only holes on edge sides and 3 of them vs the one in the middle and the 3 holes I was seeing in alot of units. anyway im going on let me know what youre experiance between water vaped ABV and direct AVB as well as the rest And any tips for fixing a overheating back end if you have any, lots of people seem to ;find ways to fix it themselfves that work while the others are stuck sending it in. Due to my units perfect preformance aside from the angles inner screen over the heater and a dent on the mouthpiece’s very tip due to how thin they machine the tip It was dented by a light bump against my dry wall they really should make it thicker or reinforced at the very least add mouthpieces for sale like the FF does with all of its removable parts once production smooths but I hope if those are problems I can fix like i said I hope they send just the new backend to start as they did for lots at least half of the people with the issue some with pre produuctions units that actaully broke open. So if you had to pick between this and the crafty for a portable discreet vape, what would your choice be? Pros & cons? Also if you see the trend of reliability continues with the added improvement in battery charge time of the production units can you foresee your score changing from a 9.0 to a 9.9 or 10? The Grasshopper is definitely more portable and discreet than the Crafty. The crafty is larger, and will take 10-15 times as long to preheat, so if you are looking for something discreet and quick to use the Grasshopper is the better choice. However I do enjoy using the Crafty more, and it has better vapor quality. It’s hard to say how high the GH rating will go, it will all depend on how it continues to perform, but it’s still working flawless after lots of continued use as of now! How big are the differences in vapor quality? What are some of the differences? Thanks for checking out the site man. Really appreciate you taking the time to comment. We added it to the white board! We are planning to take a lot of pics of all the vapes here sometime this week and posting a lot more pics/reviews/comparisons. I’ll definitely work on getting some close ups with the GH specifically. I own a davinci ascent vaporizer and i like it but i really want a new vaporizer. The pax 2 and the grasshopper are the only ones im really interested in. Can you please help and tell me which would be the best to get? Since you already have the Ascent which is a session conduction portable, I would go for the on demand convection Grasshopper to round out your collection over getting another session conduction unit. Did you try the GH without grinding the herb as a one peace in the bowl? if yes, did the herb vape evenly? there is a non electric heat-convection vaporizer called Vaponic where it seems that you don’t have to grind your herb so not to loose any trichome, but it is not practical because you need to heat it manually by external fire source, have you ever try it? what do you recommend? I have never tried the Vaponic, so I cannot compare to that, however the Grasshopper does work pretty well without grinding, better than most of the vapes I have. I do still think it works better and vapes mroe evenly if you do grind. I was wondering if / when you were expecting a new production grasshopper from Matt and Trevor. Looks like they finally have produced a handful with the new parts since they showed grasshopper #4 on their update a few days ago. Would love to get updated review / FAQ. Unfortunately I do not have an estimated date. What’s the deal with titanium and anodized titanium? I reeeaaaly want a blue anodized titanium unit but have no clue about the toxicity of heated titanium let alone anodized metal. Is it at least as safe as stainless steel when heated? Any insight would be appreciated. I would assume so but not for sure. I’ll be getting a colored TI here soon and I’ll be sure to reach out to Matt and Trevor to find out. Titanium should be safer than Stainless steel. Titanium holds very little bacteria and is used in many medical applications and is very heat resistant, again mores so than certain types of Stainless steel. Anodizing should have no impact since it is just a chemical change that happens in the outermost layer of the TI when it is heated and not an added layer that is applied. The LED light will blink blue instead of blinking red when the unit is charged. excuse the novice question but I was wondering what reason there would be for using the GH above the 3rd notch? I get that it produces fuller clouds but I don’t understand the value of the clouds. If one is only concerned with medicating and not the experience of blowing clouds is there ANY reason to go above 2 or 3? At what temp/notch does one begin burning plant material? Any suggestions on how to be patient for ordered grasshoppers that won’t be available til August (if that)? Hey, was just wondering if you knew if they have started to produce GH which is fixed and upgraded. The Grasshopper has been getting tweaks/upgrades throughout the whole production process, as they find improvements they just add them right into production. The GH’s shipping now have all the latest tweaks/upgrades. Nice, ordered mine a few days ago. Its no rush to get it, but it will be my first vape and im pretty hyped. Just hope they can follow up their new shipping estimation. 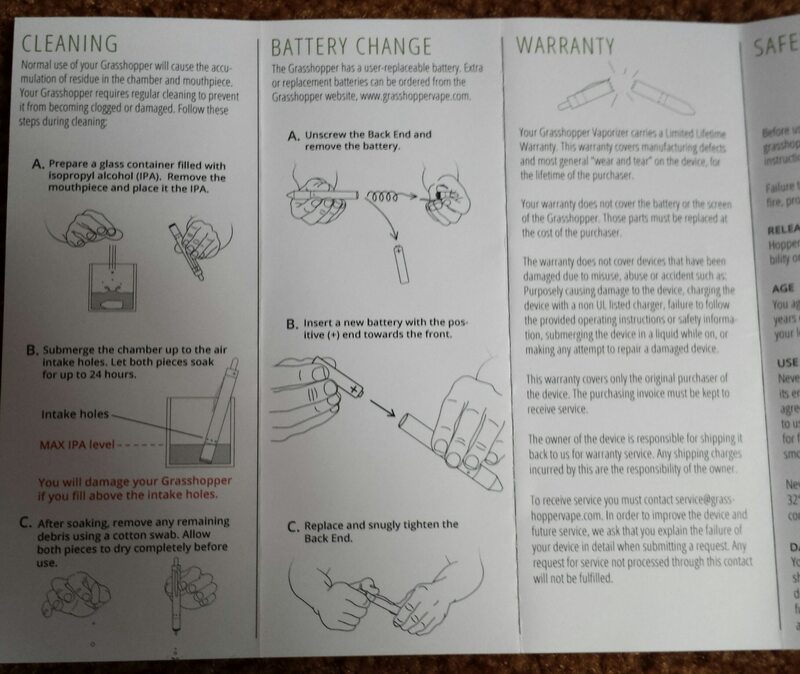 Do you get an extra battery if they dont ship it in time, or is it something i made up? Some people definitely got extra batteries when they shipment dates were not met, but assuming they have finally ironed out their estimations I assume that practice will stop. can you vape concentrates like oil and wax with the GH ? While Grasshopper Labs has not released the oil/concentrate front end which they are working on, people have still been having success with concentrates with 2 methods. The First method is to fill a bowl with herbs, and just put a tiny bit of concentrates on the top, the second is to get some organic cotton, and then wrap your dab in cotton, and then put the whole thing into the oven and rip away. How do you know when a bowl is consumed? For me its mostly when the herbs are a dark brown in color and not putting out any more vapor. I also save all my AVB (already vaped bud) in a mason jar and make butter or wax with the leftovers. With the power button, does it ever accidentally get clicked on while on the go? Is there a magnetic safety cap that can be purchased so that the button can’t be pressed in a coat pocket or in a purse/backpack? I feel like if it doesn’t have some sort of locking mechanism, it could be a safety hazard. If they haven’t come up with that at all, could you mention it to them? Maybe something as simple as a quarter turn of the power button to lock it or even simpler, just a study magnetic cap that clicks on and sits flush with the top of the button. Anyways, have you noticed any issues with it accidentally powering on while on the go? Thank you so much for the kind words Alyson!!! I absolutely love it out here. Exploring around taking pics of vapes is pretty fun lol. I’ve never had an issues with the Grasshopper turning on accidentally. You have to press pretty good to get it to turn on. But that is a great idea if people did start to have issues with it! Have you got your Grasshopper yet? How is it going so far?